At the time I started this site, the rolling stock on the layout consisted of a 1960s AHM Minitrains set. That set included a Plymouth diesel loco, two flat cars with bulkheads, and two skips. 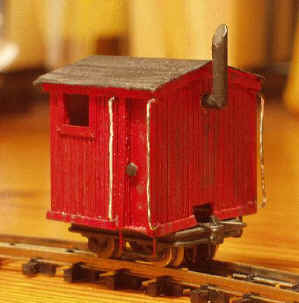 I built the caboose below on one of the flat car chassis way back when I bought the set (in the 60s). It was my interpretation of the standard gauge Kadee Logging Caboose offered at that time. I built this caboose about 1967. It was my first effort at scratchbuilding. Most of the materials were leftovers from an couple of Ambroid craftsman kits. The smokejack is from the central part of a round toothpick. The somewhat oversized doorknob is the head of a straight pin. Here's the caboose and some Egger-Bahn cars at the stone crusher. A JM Concepts 20 foot stakeside flatcar. This is a very nice kit with a laser cut deck, which is very realistic. I experimented with using stain markers to make the individual boards of the deck be different shades, as if they had been replaced, etc, and spreading spills and such on the deck. I may yet try a bit more weathering on the wood. I have another of these to build.